The New Rochelle Residence Inn Westchester takes extended stay hotels to a new level of comfort, convenience and style. 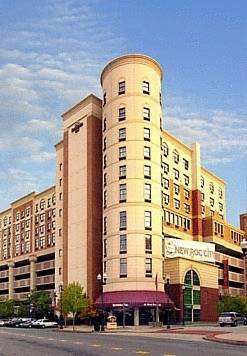 Just 20 minutes from the heart of New York City this elegant and architecturally unique 127 all-suite hotel offers exquisite views of the Manhattan skyline and Long Island Sound. Suites boasting Marriott's luxury bedding are conveniently designed to provide all the comforts of home, including a fully equipped kitchen to prepare a home cooked meal and spacious work area with free high-speed Internet. Start your day with a cup of coffee and complimentary hot breakfast buffet in our hearth room. We offer versatile banquet space, perfect for meetings or social events. Westchester, NY is home to several Fortune 500 companies, sports venues, colleges, shopping areas, and the nation's grandest historic sites. Whether you're here for business or pleasure, you will find a friendly welcoming staff to assist you with your stay 24/7.